What is Hydrogen-rich water and why should you drink it? Hydrogen-rich water, with a surplus of hydrogen gas from electrolyzing the regular H2O, has been a new trend in health living after a study in Japan in 2011 shows usage of hydrogen-rich water resulted in significant improvement in wrinkles and collagen production. 5. Buzzer remind from 8:00 to 20:00, just shake the bottle to stop the sound. Hydration Tracker & Customization: with Bluetooth technology & user-friendly IOS/Android App & built-in buzzer, this smart bottle can help you build a healthy water drinking schedule. 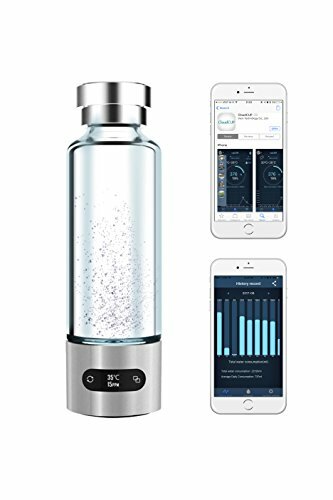 Portable Water Ionizer (Molecular Hydrogen generator): with latest technology in water ionization, this bottle keeps the pH level the same as the source water and makes water full of antioxidants ("beauty water") wherever you go. Built-in Water Purity (TDS) & Volume (ml) & Temperature (°C) detection: HD OLED indicator and sensitive touch screen make display and operation clear and simple. Premium Quality Materials: high-borate borosilicate glass body and stainless steel base/lid make this bottle bacteria-resistant and scratch-resistant. If you have any questions about this product by Geniway, contact us by completing and submitting the form below. If you are looking for a specif part number, please include it with your message.